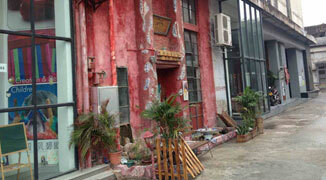 Original Element Creative Industry Design Center (OECIDC) is an up and coming art zone in Guangzhou. Launched in 2010, it was once a beer factory but now houses various types of shops, studios and, at the heart of it, is the SILO Creative Community. It’s more than just a gallery, SILO is run by artists and serves as a think-tank platform for artists to work, showcase and discuss their creative process with art enthusiasts alike. One can see the latest work of an artist on the second floor while activities like martial arts classes are held on the third floor. This year alone, the SILO Creative Community has provided the venue for events helping patients suffering from systemic lupus erythematosus (SLE), highlighted international talents like tango dancing, and held a number of art exhibitions. OECIDC, unlike bigger name creative parks, is still figuring itself out, but how exactly will the experience differ from say, going to Redtory? Roaming OECIDC on a cool autumn day. SILO Creative Community is a three-storey building inside OECIDC and getting to the red entrance of OECIDC is a 10-minute walk from the metro station. Distance is important especially when travelling at night. Day trips are better since no clear map is found once you step foot over the OECIDC threshold. SILO is another five minute walk from the entrance; a red spider will indicate you’ve arrived. Or you could roam freely through the site, eventually finding your way. The experience of getting to Redtory is very different. The first busy road you’ll be walking on is in a decaying state, when you turn left onto the boulevard, there’s a sense of a never-ending road. During the day, you can stop by the riverside and you’ll be able to see locals soaking up their day with kite flying activities. If you’re not in a hurry, it’s a pleasant walking experience before you head into the galleries. Redtory also has the joy of clear maps (still not great but better than a few months ago) and directions to galleries and venues. Since entrance is free at both venues, finding the right time to visit the area is important as well. If you have the luxury, weekdays are probably the best as you will feel wonderfully alone as you walk around. In general, visiting SILO’s gallery is open to the public during the day but getting a heads up on future events is a bit of a challenge. If you want to hear about events you should subscribe to one of SILOs social media networks. They have a Weibo account and a Wechat/Weixin group (see below for contacts). Visiting time at Redtory is also best during the day because it’s less crowded and there’s more room to navigate through the galleries without the hassles of noisy patrons or long queues at bars and restaurants. Since SILO Creative Community Centre is relatively new, the small venue is one alternative to the big galleries and other creative parks when it comes to encouraging artists, especially foreign artists who are trying to take a bite of the city’s artistic scene. Next to SILO you’ll find a Spanish-owned photo studio and a paint shop, which were started a few years ago. SILO’s ethos is all about community and, as such, the people who work there are more approachable and engaging. On the other hand, the number of galleries at Redtory is a feast for the eyes. There is so much to see that it is hard to do it all in one day. There is movement and fluidity that comes from having more money and being better-known. However, the downside of this is there are far more security guards lining the dirt paths of Redtory and it can make you feel watched. What kind of galleries and stores can you find inside? Clothing and designer stores at OECIDC have already established a niche for themselves, while others are in full-swing construction mode. SILO itself looks plain and mundane on the outside, but inside, they have renovated the space with exposed bricks, and wooden-flooring on the second floor. At Redtory, if you want to talk to some of the artists, this is possible, but you will usually need a translator to explain the philosophies behind their crafts. If you head to Redtory during the day you get to see old turned new, as shipment containers have been turned into restaurants and convenience stores. At some of Redtory’s bigger venues you will also be able to enjoy showcases from big name artists – both local and international. Whether you are at OECIDC or at Redtory, small restaurants and pubs are in business even after the galleries close around 17:30. On the ground floor of SILO Creative Community is a resto-bar where, during those warm and breezy nights, one can sit at the back of the restaurant overlooking the river. OECIDC also offers a cinema, a hair salon, a gym and two convenience stores that have already set-up shop; if you need a break from looking at art. While Redtory feels more established, and OECIDC remains raw when you leave these places at night, you still walk past abandoned buildings that are waiting for someone to transform them. Neither is finished growing or changing. Getting there: Take subway line 5 to Xicun station exit D. Turn right and right again. Walk 10 minutes until you reach red-colored entrance. Getting there: Take subway line 5 to Yuancun (员村站) exit B. Turn left and walk towards the river. Turn left again and walk for another 10 minutes. can anyone tell me what exit is the market at Sanyuanli Metro station?